Referring to the Duke of Wellington statue in Royal Exchange Square which now sports a cone on its head, singer Fran Healy explained: "Promoters generally push you to play bigger venues with more seats to make more money from tickets but playing here at the Barrowlands was all led by the BBC and there was never any talk of anywhere else. It's like putting the traffic cone on top of the statue - mixing the two things and that sums me up. Bassist Dougie Payne added: "I think part of that is not being afraid to put to that together. It's where interesting things happen when you put high and low culture together." Fran is so excited about the performance tomorrow night that he's tempted to jump off stage. He said: "Fans have been going mental on Twitter. When we are doing it I'd love to be in the audience and see it. I might jump out." The lads reckon playing with a live orchestra has been an education. From said: "You are playing with professional musicians and I'm not talking about us. We are semi professional and when you play with a professional orchestra they turn up on time, know what they are doing and can read music. It's like German transport. It's all very union." Dougie, Fran and the lads can't wait to showcase some of their songs like More Than Us with orchestral arrangements. They are also playing songs including Animals and Paralysed from their new album. 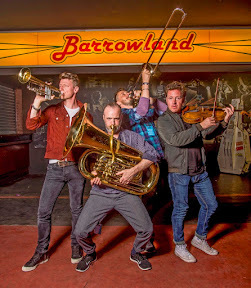 Fran added: "To bring a band like this in The Barrowlands is completely out of their comfort zone. Dougie added:"It's never been done before. It's the first time they've ever extended the stage so much the permanent barrier in front of the stage has ever been moved. It's a one off. It's so expensive we couldn't do it without the help of The BBC or a big organisation like that and and it makes it more special for us. I doubt we'll ever do anything like this again."